Print and Projected Image of the Year was our last regular club meeting for 2014. Sadly, fewer than 20 members turned up for what was a wonderful session lead by Esther Bunning. Before looking at the photographs Esther said that what she looked for in a photograph is a “story”. She said she found that relatively easy as a portrait photographer and observed that she enormous admiration for photographers who can get a sense of story into a landscape photograph. As an aside, I’ve often related how Mike Langford urged photographers to ‘make a photograph about’ a scene, rather than ‘take a photograph of’ the scene. It is hard and it was interesting to hear Esther reflect on that. On next year’s syllabus we have an evening devoted to Abstract photography. I suspect the challenge will be a notch higher! Esther talked for a while about photographers developing a personal ‘style’. The kinds of photographs they prefer to make or the approaches they like to take. She pointed out that it takes time to develop such a sense. But once you’ve begun to develop it, your photography becomes more engaging and fun! Esther called this “developing your own aesthetic”. She suggested that a good exercise to do is to trawl through other people’s photography on a site like Pinterest.com and to collect photographs that you instinctively prefer. Then take a long hard look at the collection of preferred images and ask yourself why? What are the common features of these images? Esther argued that doing that will draw out what your photographic preferences are, and begin to define your ‘personal aesthetic’. The next step is to pick up the camera and post-processing tools and try to make photographs that express that style. Many club photographers are eclectic. We tend to make photographs of anything and everything: indeed our club syllabus encourages us to have a go at different kinds of subjects and themes. Esther is laying out a challenge: can you put your own stamp on the subject? Esther made two other points that were very interesting to me. The first was about the freedom and potential that newer technologies offer photographers. She talked about the use of post-processing techniques that enable photographers to produce photographs that can express an idea even more clearly through the use of exaggerated effects or overlaid textures, and the like. Exaggerated or softened tonal ranges, colours, or sharpness. 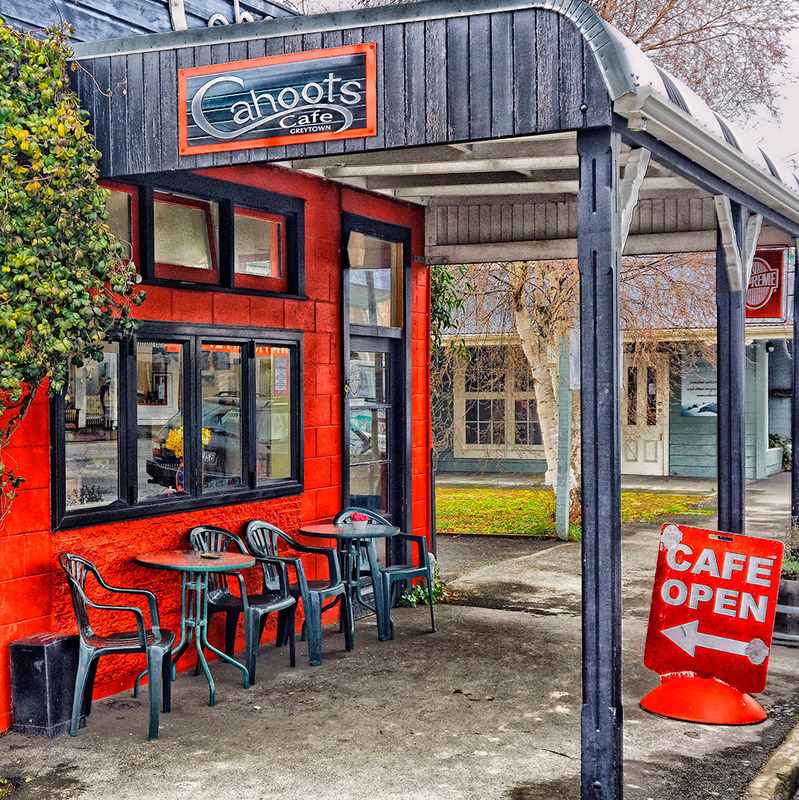 In this respect, Esther spoke for some time about how much she liked Martin Connelly’s Cahoots Café photograph. Esther and Martin agreed that the colours in the photograph do not represent the ‘reality’ of Cahoots, but that the post-processing of the photograph has emphasised textures in a way that makes the image much more compelling than an out-of-the-camera photograph would have done. How different is that approach than that of the people who say that using Photoshop to change the way things were is ‘cheating’. The second point that Esther made was about how photos are saved and shared. She hoped people didn’t simply save their good photographs in some digital format hidden away on a hard drive or among a billion others on some web-site. She hoped they were printed to be shared. Now, who do we know who keeps bleating “a picture isn’t a photograph unless it’s printed”? After the judging, Esther showed two videos about some of her work. One was a behind the scenes look at her ‘Fire-and-Water’ project, and the second was a look at the production of her ‘The Angels Collection’ book. You can see the videos here, and here. The other thing that Esther told us, which was a surprise for many at the meeting is that her go-to lenses are from the simple, variable focal plane, lineup of Lensbaby lenses. She says that the variable focus plane give her creative opportunities a prime or zoom lens can’t provide (unless you can by a horribly expensive tilt-shift lens). Further, the Lensbabys, being essentially one-piece-of-glass only, are deliberately not very sharp: they produce a soft ‘dreamy’ look which suits Esther’s style. Esther did not comment on all of the photographs we had entered. The nature of this ‘competition’ is that all of the images have previously been critiqued. She did make the general comment that the overall standard was up on what she had seen before at the club. She chose some images to discuss in more detail. Her technique was to engage the photographer in a discussion about the photograph — what were the circumstances? what had they seen? what gear/settings? (Implied was, why those settings? why that composition? etc) The conversations were, I thought, very instructive, because they helped to focus on the question “what were you trying to do?” the question which, to my mind, is at the heart of photography that’s a step above the snapshot. Unfortunately, not all the photographers she would have liked to talk to, were at the meeting. All of the entries can be seen on the Gallery page here. As usual, the selections provoked some discussion: not the least being whether or not it is a good thing members to re-enter an image which had ‘tanked’ in an earlier competition, to get a ‘second opinion’. Would you have made different selections? More on this in another post. This entry was posted in Competition Results, News on November 6, 2014 by Compsec Waicam.